Creation Technologies is a global top-25 and North American top-10 electronics manufacturing services (EMS) providerwith business units around the world: Canada, the U.S., Mexico, and China. 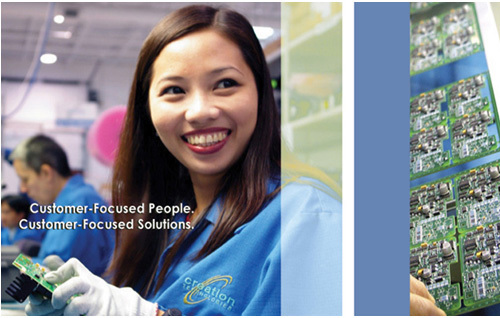 We focus on building premier customer relationships with companies requiring high-mix, high-complexity start-to-finish manufacturing and supply chain solutions in the Industrial & Instrumentation, Medical, Communications & Wireless, Computing & Media, Transportation, Defense, Security & Aerospace and Environmental industries. Why do over 200 Original Equipment Manufacturers choose us as their EMS provider of choice? ISO 13485-certified and FDA-registered, Creation Technologies provides turnkey electronics design and manufacturing for Medical OEMs. At Creation, we understand that there are distinct considerations required in the design and manufacture of Medical devices to provide the exceptional quality critical to our customers' success. In addition to our ISO 13485 certifications and FDA registrations, our robust processes and specialists in Medical Device Design, Manufacturing and Test ensure speed-to-market, product traceability and reliability for our Medical Device customers. We have considerable experience in building a wide variety of Medical Devices. From fine, intricate electronics required for cameras used in brain surgery to 15-pound power boards for x-ray instrumentation, Creation has the expertise required to provide you with a complete manufacturing solution through the life of your product. Additionally, Medical Device design and development is a specialty for our Creation Design Servces team. The Creation Design Services team has more than 25 years of engineering expertise including risk mitigation and product transfer, and imaging, mechanical, fluidics and software development. With extensive experience designing FDA Class I, II and III devices, Creation Design Services is an ideal choice to commercialize your product. Whether you need complete Product Design & Development or some key Engineering Services, at Creation Technologies, we work with our customers to achieve unique solutions for new and evolving product requirements. Our expert team can provide you with standalone Product Design services. Our team can also provide you with an end-to-end solution that takes your product from design concept and pilot builds, to production in one of our 10 manufacturing locations around the world, to after-market repair and recycling. Either way, you're in great hands. Creation Design Services is Creation's Product Design & Development team of 55+ Design Engineers, conveniently located in our 2 Design Centers: one in Denver, CO and one in Milwaukee, WI. For two decades, our Design Services team has helped more than 300 companies—Fortune 500s and start-ups alike—to capitalize on their ideas and commercialize their products. We have experience designing and commercializing products across industries including Industrial & Instrumentation, Communications, Defense, Security & Aerospace, and we specialize in complete Medical product development under an ISO 13485-registered and compliant process, including project planning and management.